for your phone to kill some time, you might want to open this app instead and make an image collage. Beats playing another round of Angry Birds! Who knows, you might come up with something worth posting on your other social media – Instagram and Pinterest are both perfect places to post image collages, since it's image collages that draw people to those platforms in the first place. If you click "create" on the Polyore website, a blank slate pops up beside various items of clothing and jewelry, inviting you to drag and drop into empty squares. You don't even have to read the directions, it's so user-friendly. Within minutes you'll find you've created your very own mini fashion-magazine spread. To incorporate images of your own jewelry into these spreads, it's more effective to use your desktop than the app on a mobile device – but slightly more complicated to set up. You have to first install the "clipper," a browser bookmark, by dragging and dropping from the Polyvore site to the Bookmars Toolbar on your browser. Then you just click the bookmark whenever you see something you want to "clip" – like your own jewelry. "It's just like the bulletin boards of old and so much fun," Joanne Teichman, co-owner of the jewelry ecommerce site, Ylang23.com, who made quite a few Polyvores herself. She was one of the first to add the mini-Polyvore app to her site, inviting customers to put their own together. Eventually, she was asked to host a Polyvore competition for Stand Up to Cancer. "Since I'm also a Breast Cancer Survivor, and just couldn't seem to create enough Polyvores to honor friends." I can see how this would be addictive. 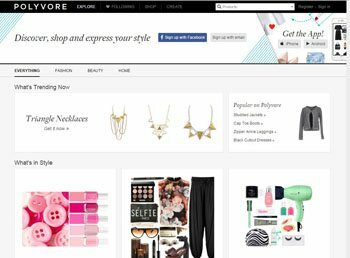 Polyvore mania reached a peak a couple years ago, but the site is still getting discovered and upgraded. It's now up to 20 million unique visitors a month. Its product collages are a great way to showcase your jewelry, suggesting new ways to pair the tsavorite in your earrings, for example, with a designer bag or an outfit in the colors of the season. It's definitely a girly pleasure. But given that many of us are females making jewelry for females, and we all grew up with fashion magazines, this particular art form has a comforting familiarity your customers may relate to. CATHLEEN MCCARTHY is a freelance writer whose stories appear in Town & Country, AmericanStyle, Art & Antiques, and her own site, The Jewelry Loupe. Follow her on Facebook, Twitter and Pinterest. NET PROFITS is a regular feature about using the Internet for jewelry selling of special interest to those with a home-based jewelry business that appears in Lapidary Journal Jewelry Artist. Learn more in “New Ideas for Social Media Marketing” in the July 2015 issue.